Now here’s a product that I know a lot of people will have been waiting for. Dr Marko Lens, a renowned authority on everything “sun and skin” (he’s a leading figure and active researcher in the fields of skin cancer and skin ageing) has launched a sunscreen. Not just any sunscreen, either – this one is packed full of antioxidants and moisturising ingredients that would put many standalone “anti-ageing” creams to shame. It’s a bit of a two-in-one, this sunscreen, helping to repair and protect the skin at the same time. I suppose, though, I wouldn’t have expected anything less from the brand that has already brought me the Transformer Mask and the Triple Action Advanced Eye Cream. 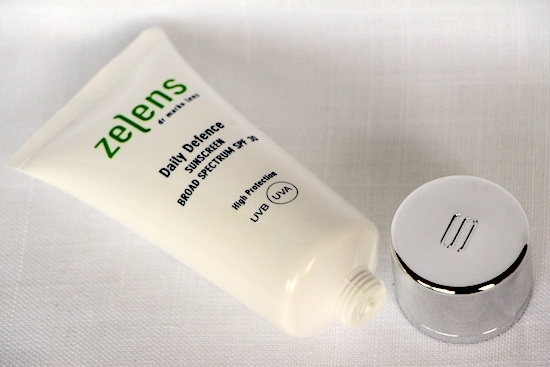 Zelens Daily Defence Sunscreen is a lightweight formula that doesn’t leave any residue and provides the very best protection. I say that without exaggeration; Dr Lens has spent years developing this product, making sure that it’s completely photostable (many on the market aren’t – they degrade when they are exposed to sunlight, which seems a bit pointless!) and he has formulated it with potent antioxidants to help the skin to protect and repair itself. This is a hi-tech face cream and at the same time, a broad spectrum sunscreen, and it’s notoriously difficult and expensive to get this kind of formulation right. For me, this cream just stands out as a really trustworthy and effective option in the total minefield that is “sun protection”. It is by no means a cheap option, but then none of the Zelens products are; they are high-end, cleverly formulated and thoughtfully developed. There are far more expensive SPFs than this one that seem to have very little in the way of innovation or jazzy science to justify the price-tag – I think that £55 for a good antioxidant day cream AND a photostable, effective sunscreen isn’t too bad at all. It’s easy to balk at forking out money on sunscreen, especially when it’s something that has to be applied so often, but I suppose that if you would pay fifty quid or so for a moisturiser then it figures that you should be prepared to pay the same for a product that will do so much more than moisturise. Application: if you don’t have particularly dry skin, like me, then you can apply this straight after serum. It contains Hyaluronic Acid, which helps your skin to hold onto moisture, so if you’re oily/combination, you might like to skip the moisturiser stage. Or not. Absolutely up to you; I just sometimes feel queasy if I have too many layers of product on my skin! Make sure you tune in later on in the week – I have done a Q&A with Dr Marko but am just writing it all up before I hop on a plane to Cannes. Not enough hours in the day. (Oh, Me miserum! Ha.) I’m also testing some other sunscreens that will please those who are funding their beauty habit on a tighter budget – I’ll get those written up for you as soon as I can! The Zelens Daily Defence Broad Spectrum Sunscreen SPF30 is £55 from Cult Beauty with free delivery. Previous Post Off to Cannes!